Totally remodeled and looks great! 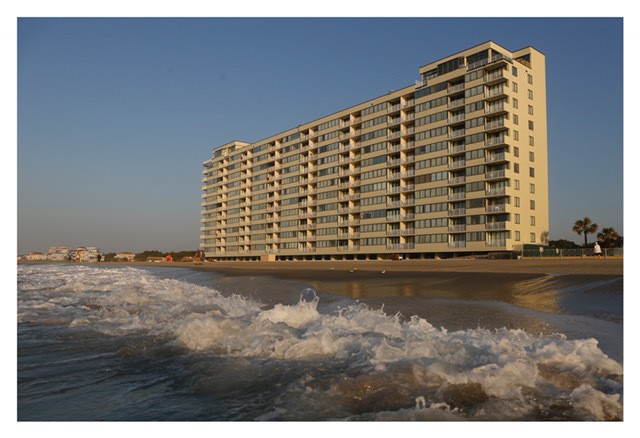 This great condo in Sands Beach Club is a wonderful oceanfront corner unit with a great view. You can enter the balcony from both the spacious living area and master bedroom. Dining area for entertaining and fun game nights is sure to be a hit with all. Amenities include an indoor/outdoor pool and whirlpool, basketball and volleyball court, lighted tennis courts, covered parking area, elevators, and coin operated laundry facilities. "It was great. Beach front great views and great facilities." "It was very nice. A few hiccups along the way but management fixed them quickly. One word of advice though there needs to be more pots and pans for those who like to cook while on vacation. It was very hard trying to cook with the little amount of pots and pans available." "We loved having an oceanfront condo. The view and sound of the ocean was spectacular. The only negatives to the unit we were in: Keyless door -- no clear instructions on how to lock it -- we attempted a couple of different ways with success only once. The Spectrum Cable TV service was intermittent -- every 2-3 minutes it would black out and then come back. The unit decor is nice, but still a bit dated. Master Bath could use a new tub/vanity. There was only 1 blanket in the unit -- bring your own!" "This has been a favorite location of ours. This year was the first time in a few years since we stayed here. The unit we were in needed to be updated and repaired badly! Generally the facility looked worn. It was disappointing but the location cannot be beat. Hopefully other units aren't as sad looking." "The unit was nice! You could tell it was a rental and was in need of some minor updates. It was clean and decorated nicely. Would definitely stay here again!" "Our stay was very pleasant, relaxing, and satisfying." "The vacation rental place was great. We didn't get the room we requested because of unforeseen circumstances but they did give us a comparable had some issues but overall pretty good. Check in & check out was super easy. Overall I would definitely use the agency again. ..not sure if we want to stay at beach club again." "It was about what I expected. Clean and good location, good parking. The sliding door was in bad shape to balcony. Extremely difficult to open and close. Also, there was no lobby or contact for assistance. The onsite restaurant was just bad. This bldg. is old but pretty well kept. It's also currently being renovated some, but it did not interfere with our stay at all. The outdoor showers were constantly running with nobody there and I would shut them off every time I walked by. People can be really lazy. The knobs were very sticky and you had to pull on them to shut off the water. I guess it was too difficult for some, but they should fix that. It created a lake that you had to walk thru when leaving the beach. We had a great time! a plus. We are booked for October and next March." condo was great. We are returning in March for the month at the same condo...."
"Check in was a breeze, our condo was fabulous and our vacation was great! With a key coded door check out was just like leaving your own home. Would totally reccomend Myrtle Beach Vacation Rentals." "Condo was fine except - room not ready till 4:30 and toilet 'ran'. A new flapper was installed that greatly helped problem but did not fully correct. Like code on door." "We had a fabulous time! Great location - quiet, convenient, laid back! Condo was very clean, warm & inviting. Beautiful oceanfront view! " "We were in Myrtle Beach to spend the Easter break with family. This place could not have been better. Its' location is perfect in North Myrtle. The unit has anything you could possibly need from kitchen supplies to beach items. The rental company has excellent customer service. We did not pick up our parking passes when we checked in. When we called about them, someone brought them right over to us! I never expected delivery. This place was fabulous. I hope to be able to rent it again in the future. " "a good experience, condo well located for entertainment and eating facilities. Beautiful view of Atlantic from balcony. 2nd bedroom a bit tight for 3 people, and needs a bit of updating. Over all a pleasant stay. " "Everything was great! Loved the condo and the location! We will stay again!" "I did not stay in this unit ... My brother and family did... I booked and held the unit in my name until he checked in . "It was a great time in a very nice place to live. We loved it"
"It was a great experience! We really enjoyed the place and the view. Nice and clean! Thank you!" "Everything that they said was there, was there. We felt like we were right at home. Amazing stay!" "Pleasantly surprised with the room and the reservation staff. Although the on-site timeshare staff was unpleasant and rude when informed we rented the property an were not a time share members. " "I am so so pleased. Everything is excellent. " "Very much enjoyed our stay. The condo was clean and in great condition. Can't beat the location and nearly private beach. A little disappointed that the onsite restaurant and bar were closed. "